Seasonally, every year, Bike to School month returns in the spring (usually May), and Walk to School Day returns in the autumn. 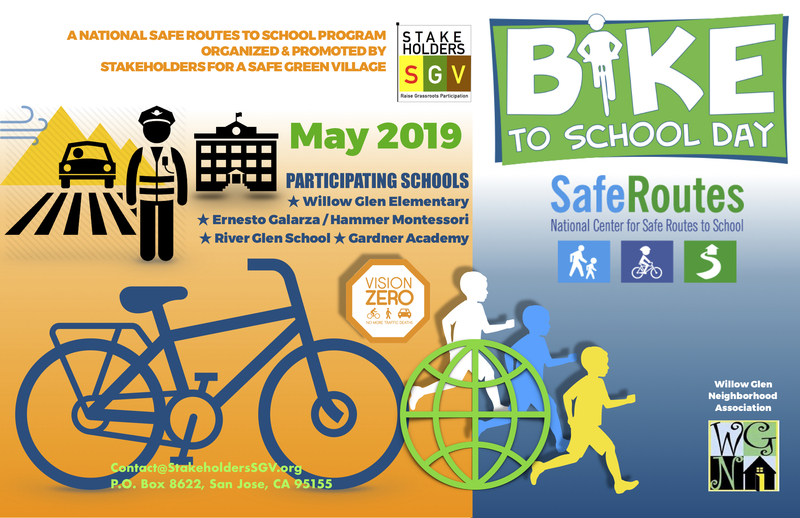 Stakeholders for a Safe Green Village sponsors and organizes our annual National Center for Safe Routes to School"Bike to School" activities, the next occurring in May 2019. Co-sponsors include Willow Glen Neighborhood Association - WGNA and other groups. Through the year, and as part of the celebrations, students at our elementary schools receive bicycles, helmets, and razor scooters. This national event is organized locally by Stakeholders for a Safe Green Village in partnership with the National Center for Safe Routes to School. Our regular co-sponsor is the Willow Glen Neighborhood Association - WGNA. On Thursday 10 October 2018, students, parents, and teachers last met together at the Bank of America Parking Lot on Lincoln Avenue. In celebrating "Walk to School Day", we all came together for a morning reception and continued to our respective schools. Team mascots appear, including "Q" of San Jose Earthquakes, "Gigante" of San Francisco Giants/ San Jose Giants, and "Stomper" of Oakland Athletics. Area students and families are invited to participate, along with other area dignitaries. We have snacks and giveaways for the participants. Last May 2018, team mascots appeared at Gardner Academy, for bicycle rodeo day, including "Q" of San Jose Earthquakes. Several students in the various Willow Glen Schools also received free tickets and were invited on the field for the kickoff of the June 9th, 2018 game — San Jose Earthquakes vs. Los Angeles Football Club— at Avaya Stadium, San Jose, CA. Several students at our Willow Glen Neighborhood Schools received prize tickets to the soccer game — The San Jose Earthquakes versus Los Angeles FC at the San Jose Avaya Stadium — scheduled for June 9th, 2018 at 7:15 PM. The game tickets were courtesy of Stakeholders for Safe Green Village (Stakeholders SGV), purchased by the co-sponsorship of the Willow Glen Neighborhood Association (WGNA); Willow Glen Business Association(WGBA); and the Table Restaurant. We also thank the Earthquakes for their free giveaways, school assembly demonstrations, mascot appearances, etc. Together, we have promoted Safe Routes to School, and community pride. We invite you to enjoy “Willow Glen Neighborhood Night” with the Earthquakes! And enjoy your end-of-year summer vacation!